When Anya Balanchine is released from Liberty Children's Facility, she wants nothing more than to go back to school and live a normal, peaceful life with her younger sister Natty. Unfortunately, wherever Anya goes, controversy and illegal activity is sure to follow, and it isn't long before the family business she wishes so badly to escape comes back to put a stranglehold on her. At first Anya spends a great deal of time and energy trying to break through the chains of her family business, but she soon realizes that escape is futile and she must surrender to what Michael Corleone and she now know is true: "Every time I think I'm out, they pull me back in." 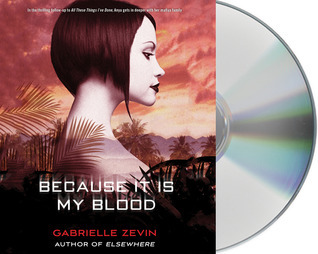 Because It Is My Blood is the second book in the Birthright series by Gabrielle Zevin, the first book being All These Things I've Done, which is where we learn that Anya Balanchine grew up in a world where coffee and chocolate are illegal, but her family runs a very successful chocolate company in Russia, selling their wares on the black market in the U.S. And just like All These Things I've Done, Because It Is My Blood has a quiet power to it. Anya is one of the strongest, fiercest female protagonists I've ever come in contact with and yet that ferocity is coated under a thick layer of stoicism and control. And despite her reserved nature, Anya is not cold. She comes across as quite likeable even though in the hands of a less dextrous author, I'm sure she would have come across as icy and robotic. I continue to marvel at what a contradictory yet empathetic character Zevin has created in Anya Balanchine. Just as with the first audiobook, Because It Is my Blood is narrated by Ilyana Kadushin and she is every bit as perfect for the role of Anya as she was in the first book. If you read the first book and enjoyed it, there is no doubt in my mind that you will enjoy the continuation of Anya's story in Because It Is My Blood. My only real contention with this book is that it is categorized as dystopia when it reads nothing like a dystopia. In my review of All These Things I've Done, I called it dystopia-lite because while society has degraded and become more corrupt, it wasn't drastic enough to feel dystopian. There was no Big Brother, or factions, or an arena full of kids fighting each other to the death. Corruption was evident but not perverse as it is in most dystopias. Hmmm. Chocolate and caffeine are outlawed and it's not a dystopia? I see your point, though. I wish they hadn't changed the covers. I loved the original one, and can do without the dreamy girls on the cover. I agree I don't like the new covers. I like the background of the first book, but I could do without the girls.